In August 2011, Rose and I took a helicopter tour of Chicago through Sun Aero Helicopters in Lansing, IL. From Lansing, our flight flew directly north to the lakefront at around 95th St. We flew over the lakefront and past the Museum of Science and Industry and further north past the University of Chicago campus. It took only 10 minutes from the time that we took off until the time that we approached McCormick Place in Chicago. After passing McCormick Place, our helicopter guide flew us north over the Monroe Harbor, over the Chicago River by Lake Point Tower and past the John Hancock building in the north loop and began to circle back around to the west side of downtown Chicago. From here, we had stunning views of the city with Lake Michigan in the background. The sun was behind the helicopter and reflected brightly off of the buildings, creating a cityscape of vibrant colors. As we flew further south, our pilot guide flew towards the south end of the loop. This is where the above photo was taken. In the photo, you can see the green roof of the Harold Washington Library, University Center, which houses students from nearby Robert Morris University, as well as the historic Hilton Towers on Michigan Ave (far bottom right corner). Also seen in this photo is the Printers Row neighborhood of Chicago. 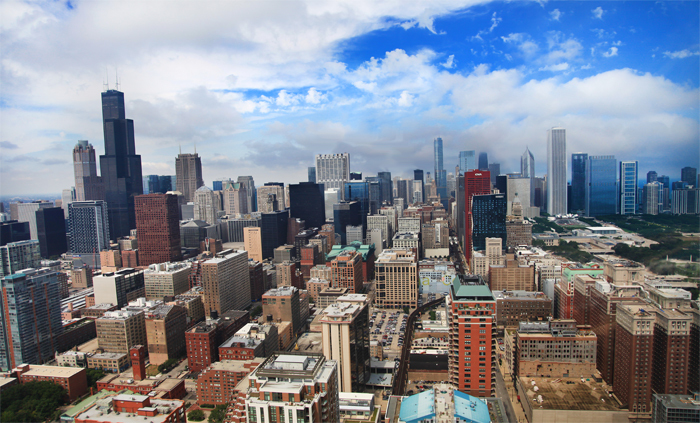 Below is our recording of our Chicago helicopter tour video. It’s pretty long…we take off at about 4:30 and land around 25:15. There isn’t very much footage of the city up close since I used the camera (a Canon 5D Mark ii) for photos. However, it was a beautiful day and the video was recorded in HD 1080p, so if you are from the near south suburbs of Chicago or nearby Northwest Indiana, you will certainly recognize many of the sites. It is easy to identify I-80/94 and the Torrance Ave interchange in Lansing, River Oaks Mall in Calumet City, the Chicago Skyway and much more. Aerial South Downtown Chicago by Joey B. Lax-Salinas is licensed under a Creative Commons Attribution-NonCommercial-NoDerivs 3.0 Unported License. Permissions beyond the scope of this license may be available at http://www.joeyblsphotography.com.